Today, the Society has many members. New membership is open to anyone with a sincere interest in orchids who would like to participate in the activities of the club. Club activities include displays, shows, workshops, nursery visits, private collection viewings, inter-club visits, auctions, raffles, field trips and other outings. So whether you have one orchid plant that you love and cherish, or one thousand orchid plants, we invite you to come along to our meetings. Meetings are held on the 1st Wednesday of each month except January starting at 7:30pm. They are held at The Parish Centre, 8 Stevenson Street, Mandurah. 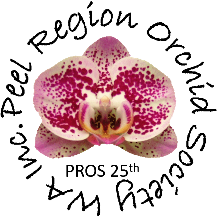 You can participate in friendly orchid talk, listen to an expert speaker and enjoy some light refreshments. We believe our Society stands out from the rest by its friendly, welcome and relaxed atmosphere. Full membership entitles you to participate in all club activities, access to the club’s library, receive invitations to special events hosted by the club and receive the club’s monthly newsletter and cultural notes. Online memberships are available to anyone wishing to receive the club’s monthly newsletters and cultural notes by email. This type of membership is ideal if resident out of the Peel Region and are unable to attend the monthly meetings.